Maz Entertainment offers PA systems for your wedding music, as well as wireless handheld and lapel microphones for your ceremony and vows. Ceremony packages vary in price based on size, start time and travel required. This package includes music from 8pm-2pm as well as all time needed for setup and takedown. Our DJs will take requests from your guests, and we are able to download any song if we do not already have it. We email a wedding information sheet that goes over what we need to know and makes sure that we are prepared for any requirements you may have. Let Maz Entertainment make your wedding dance a memorable one! This package includes everything mentioned in the dance package, microphones for speeches and toasts, and background music during supper. This package includes service from 5pm-2am but DJs can start earlier or stay later upon request. Pair any of these packages with our extras to create your perfect wedding. Up lighting helps bring your room to life. It can be used on the head table as well as around the room to create stunning visual effects. 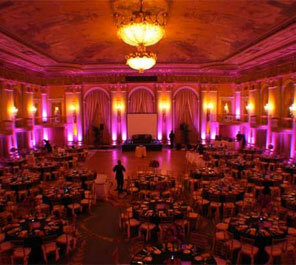 All up lights can also be programmed to match wedding colours or preferred colours. 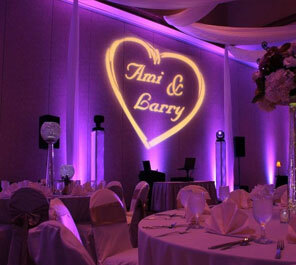 Monogram Gobos are a great way to make your event stand out. There are a variety of designs to choose from with different fonts and colours. Order must be placed at least one month prior to event, as gobos need to be custom ordered. 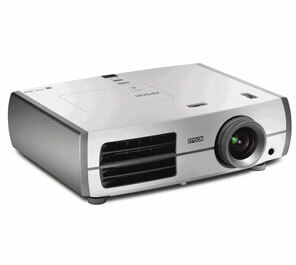 All our projectors are 1080p and come with a 100-inch screen. Laptops are connected to projectors through HDMI. Maz Entertainment can assist with the setup but does not provide the laptop to run the slide show. We can live mix audio for your slideshow as well.